A Ukrainian actor and comedian who portrays the country’s president in a television series is running to be Ukraine’s real president — and a Monday poll shows him leading the incumbent by roughly 5 percentage points.Volodymyr Zelenskiy, 41, is running for president while starring in the popular show “Servant of the People,” and he has the support of 15.4 percent of voters, reported Reuters. Incumbent President Petro Poroshenko has 10.5 percent, and opposition leader Yulia Tymoshenko has 8 percent. The election is roughly a month away on March 31, reported NBC News. 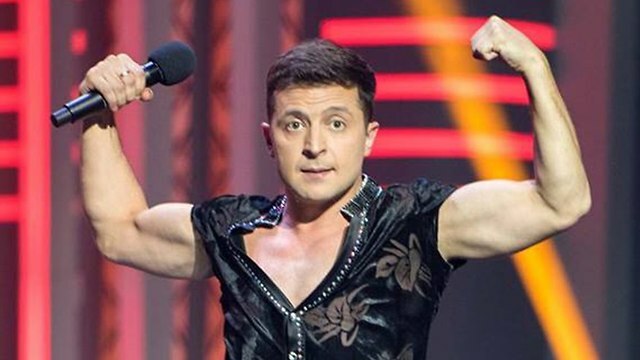 Zelenskiy studied law but found success in comedy instead. He has taken an unorthodox approach to campaigning by “selling tickets to gigs at which he parodies many of the politicians he is running against,” according to NBC News. His supporters also tune into his videos on social media, a tactic that’s new in Ukrainian politics. Zelenskiy has stated he’s a member of the brand new Servant of the People party, created after the show became a success. Zelenskiy has said if elected he would speak directly with Putin because he is ready “to negotiate with the devil himself as long as not a single life is lost,” reported NBC News. He has also satirized Putin in numerous comedic skits. Zelenskiy has pledged to make Ukraine “prosperous” again and has not shied away when others have compared him to U.S. President Donald Trump. “We are both from the same industry after all,” he joked when asked if he would negotiate with Trump according to NBC News. A popular comedian seen as "soft" on Russia and who said he would actually sit down with Vladimir Putin to talk peace looks to upset Ukrainian politics, as he's significantly leading in exit polls during Sunday's presidential elections in Ukraine. Volodymyr Zelenskiy, who incidentally played the president on TV as part of his comedy career has according to exit polls cited by the BBC received 30.4% of the vote, with current president Petro Poroshenko second with 17.8%. "I'm very happy but this is not the final result," Zelenskiy told the BBC moments after after the exit polls were announced, while incumbent Poroshenko, who has led Ukraine since the February 2014 Maidan conflict that toppled former pro-Russian President Viktor Yanukovych, described the forecast of his defeat as a "harsh lesson". Though there have been reports of election violations, President Poroshenko acknowledged Sunday’s presidential election as "free" and having legitimately "met international standards," according to Reuters. The country of 44 million is choosing from a packed field of 39 presidential candidates; however Zlelenksy — already very familiar to much of the population through TV — has consistently polled as the front runner. Ukraine's president will be determined during the April 21 run-off, where Zelensky is projected to beat both Poroshenko and former Prime Minister Yulia Tymoshenko. The 41-year-old Zelensky is as pro-EU as much of the rest of the field, but has kept things deliberately light, presenting himself as part-politician, part satirical comic, who has done little to campaign beyond presenting himself as a "common sense" citizen. Mr Zelenskiy is aiming to turn his satirical TV show Servant of the People - in which he portrays an ordinary citizen who becomes president after fighting corruption - into reality. He has torn up the rulebook for election campaigning, staging no rallies and few interviews, and appears to have no strong political views apart from a wish to be new and different. His extensive use of social media appealed to younger voters. It could be Ukrainians are ready for a general calming of tensions over and against Poroshenko's tough anti-Russian and pro-nationalist talk of "Army, Language, Faith" — and amid his corruption allegations and a recent scandal involving defense procurement. Electing a comedian and political satirist certainly represents broad disillusionment with Ukraine's political elite, which have overseen years of intermittent regional conflict and a stagnant economy. Zelenskiy is seen as a more familiar "common man" and political outsider with no experience, compared to chocolate magnate Poroshenko, who is among Ukrainian's wealthiest people. Zelenskiy said on Sunday just after casting his ballot in Kiev "A new life, a normal life is starting." He added his hope for a new political landscape marked by "a life without corruption, without bribes." Why not a comedian? We opted for a reality TV star. He has certainly been entertaining. Best President we have had in a long time, maybe they will have similar good fortune. "Best" is questionable. "Least boring"? Definitely. I’m a firm believer in “adverse publicity”, unless it’s something this damaging! It was recently reported that the fortune of Ukrainian president Petro Poroshenko surged nearly a hundredfold in 2018. On 31 March 2017, Poroshenko’s reported wealth was some $600,000. On 31 March 2018, Poroshenko’s reported fortune totaled some $57 million (95 times as much as a year before). Around $40.4 million of Poroshenko’s income reportedly came from return on investment in Zurich-based Rothschild Trust Schweiz (a subsidiary of Rothschild Bank AG). The Ukrainian president also earned $14.7 million in profit from the Prime Assets Capital investment fund, while returns on domestic government loan bonds amounted to nearly a million dollars. Meanwhile, his official paycheck is $12,400. The average monthly salary in Ukraine in September 2018 was about $320. With Yulia Tymoshenko third with 14.2%. I believe that the Top ranking SBU (Ukrainian Security Service) agent Vasily Prozorov is a liar, but there could be some truth in his statements for the Russian state media. After he “escaped” to Russia, Prozorov has said. The Ukrainian was an accomplice to the MH17 flight disaster over Donbass. Not based on any evidence but strictly on “It is my personal opinion and it relies on certain information”. He also tells about a “torture prison” where inmates get murdered on a regular basis. Again no “evidence”, but here he tells that he’s a witness. Poroshenko controls the intelligence agencies that commit these foul acts. Last edited by Firestarter; 04-02-2019 at 08:45 AM. Do NOT ever read my posts. Ukraine's interior ministry on Saturday called on a comedian tipped to become the country's next president and his incumbent rival not to exacerbate tensions ahead of a run-off in a high-stakes election.Nerves are starting to fray as polls show the comic and actor Volodymyr Zelensky easily defeating President Petro Poroshenko for the leadership of a country seen as the biggest frontier between Europe and Russia. After the first round of voting -- in which the 41-year-old political novice outshone the 53-year-old president -- the gloves have come off, with the rivals trading barbs and sparring bitterly on television. "We are approaching the final phase of the election campaign and the atmosphere in society is tense," Ukraine's deputy interior minister Sergiy Yarovyi said in a statement. "The mood of open hostility between the candidates is being stoked," he added, calling on both teams and their supporters not to play dirty. "Do not rock the boat ahead of the second-round of voting." This week police launched a criminal probe after a video emerged online of Zelensky being hit by a truck. The video ended with a line of white powder -- possibly cocaine -- being snorted through a rolled-up bank note, an apparent allegation of drug abuse. Zelensky's campaign pointed the finger at Poroshenko's team, which has denied involvement. In a testy phone exchange between the rivals broadcast live on television this week, Zelensky refused to debate Poroshenko before next Friday, repeatedly interrupting him. He then hung up on the Ukrainian president, leaving Poroshenko speechless. Many were taken aback at the sight of a humiliated leader, with his long-time rival Yulia Tymoshenko recording a video address. "While fighting for the right to become president , do not destroy the honour and pride of the status of the president," said the former prime minister, who came third in the first round of voting. "It's necessary to remain human," she added. Poroshenko has called his rival a "clown" and a "puppet" of oligarch Igor Kolomoysky, who owns the channel that broadcasts the entertainer's shows. Support for the comedian among voters has doubled to 61 percent since he won the first round on March 31, according to the Rating pollster. Ukraine's incumbent leader on Sunday warned the country's future was in danger as he failed to lure out a comedian tipped to become the next president into a debate before a high-stakes run-off vote.The actor Volodymyr Zelensky's predictable no-show prompted President Petro Poroshenko to stage a one-man debate at Kiev's Olympic Stadium as several thousand supporters flooded a nearby square. Inside, two podiums were set up at the stadium's make-shift press centre and a moderator set down rules in front of journalists. Outside the sports arena that seats 70,000 the Ukrainian leader's supporters chanted "Poroshenko" and urged Zelensky to show up. With one week to go before the vote, Poroshenko, 53, has been eager to spar with the 41-year-old political novice and accused his rival of avoiding hard-hitting questions. He also said he would respect the "choice of the Ukrainian people" if Zelensky were elected president on April 21 but added he was worried for the country's future. "I do not like that a presidential campaign in Ukraine looks like a silent movie," Poroshenko said, standing next to Zelensky's empty podium. "I must say: Ukraine's fate is in danger," he said at the end of his hour-long appearance. Poroshenko has been scrambling to recover lost ground in a bruising campaign as polls show Zelensky easily defeating the incumbent for the leadership of a country locked in a war with Moscow-backed separatists. Zelensky, whose political experience is limited to playing a president on TV, has shunned traditional rallies, instead performing satirical shows. He however capitalised on frustration over mainstream politics, war with Kremlin-backed rebels, poverty and corruption to defeat Poroshenko in the first round of voting on March 31. Support for the comedian among voters has doubled to 61 percent since then, with Poroshenko on 24 percent, according to the Rating pollster. The Ukrainian president has touted himself as the only candidate able to stand up to Russian President Vladimir Putin and repeatedly urged the comic to hold several rounds of policy debates. Zelensky has said he was ready to debate the Ukrainian president next Friday. Satire is the lowest form of humor. Ukraine brings shame on themselves, for taking this joker seriously. Another way to look at it is that this means you could run for office. Running for office is just as important as voting, if nobody ran for office then nobody would be able to vote. In his startling run to become Ukraine's next president, comedian Volodymyr Zelensky has enjoyed a key advantage over his rivals: strong support from the country's Russian-speaking regions.Despite vowing to keep Ukraine on a pro-Western course, Zelensky has polled particularly well in areas of the country where Russian speakers make up large parts of the population. A native Russian speaker himself from the central city of Kryvyi Rig, Zelensky appears on track to deal an upset defeat to incumbent Petro Poroshenko in Sunday's second round of voting. The political novice will face a slew of challenges, from a stalled economy to continued conflict with Moscow-backed separatists in the east. But for supporters in his hometown like Volodymyr Tignyan -- a secondary school teacher who taught Zelensky physics some 25 years ago -- the comedian represents a real chance for change. "I hope that when he gets into power everything will change for the better," the 64-year-old told AFP. Zelensky was a "conscientious, dedicated and responsible" student, Tignyan said, qualities that should serve him well if he does become Ukraine's next leader. The 41-year-old actor, whose only previous political experience is playing the president in a TV show, has largely steered clear of national identity issues. That has set him apart from Poroshenko, who has used patriotic slogans and mocked Zelensky's spoken Ukrainian. The latest survey projected Zelensky taking 60 percent of Sunday's vote, against 25 percent for Poroshenko. In the first round of voting two weeks ago, the comedian took around 30 percent of the vote nationwide -- well ahead of his nearest rivals. That gap was larger in Russian-speaking regions of the country, with Zelensky winning 45 percent in Kryvyi Rig. The presidential candidate and comic actor Volodymyr Zelenskiy is likely to win Ukraine's presidential election, according to an opinion poll published on Tuesday.The poll by the KIIS research firm showed Zelenskiy, a political novice who plays a fictional president in a popular TV series, on 72.2 percent of the vote. Incumbent Petro Poroshenko was on 25.4 percent. KIIS polled 2,004 voters in all regions, except annexed Crimea, from April 9 to 14. Last week, a poll by Reiting research agency gave Zelenskiy 61 percent of votes and incumbent Petro Poroshenko 24 percent. Comedian Volodymyr Zelensky and Ukrainian leader Petro Poroshenko on Wednesday finally agreed to a debate to close a presidential campaign that has at times descended into farce.The press teams of both candidates however confirmed the pair would meet on Friday afternoon at the sports arena that seats 70,000 people, ahead of Sunday's decisive second-round vote. With Zelensky scoring 72 percent support to Poroshenko's 25, according to the most recent opinion poll, this could be the last chance the incumbent has to boost his flagging campaign. Until he announced his candidacy at the start of this year, 41-year-old Zelensky's political experience was limited to playing Ukraine's president in a popular TV show. On Wednesday, his team was promoting the debate on social media, encouraging the public to be "witness to an event that will go down in the history of Ukraine". They said it would be the "largest scale" event of its kind ever staged in the country. The two men took drug tests earlier this month, after Zelensky insisted this was a requirement before any debate. Poroshenko, 53, has long pressed his opponent to meet him in a debate and a group of Ukrainian news media this week demanded Zelensky hold a press conference to answer their questions. But the actor has almost completely eschewed traditional media and campaign events, preferring instead to communicate with voters through social media and comedy shows. SouthFront‏ @southfronteng · 1 min. The comedian who is odds-on favorite in Ukraine's presidential election promised Thursday to hold a nationwide referendum on joining NATO only after building a national consensus on the issue.Volodymyr Zelenskiy, a popular comic actor who's leading in the polls far ahead of President Poroshenko, said "we have clearly chosen our path to Europe." But he emphasized the need to secure a solid majority backing the country's prospective membership in the alliance. "It's obvious that NATO means security and the military's high level, but I want to unite the country," he told RBC Ukraine website. Zelenskiy added that he would appeal to people living in the mostly Russian-speaking eastern Ukraine to dispel their negative view of NATO. "I will record daily video appeals to the eastern regions of Ukraine to tell them that NATO isn't a beast that is going to swallow you," he said. Zelenskiy vowed to make ending hostilities in the east his top priority. In Thursday's interview, he pledged to reach out to people living in the rebel-controlled areas to again make them feel part of Ukraine. Poroshenko's government has introduced a sweeping transport blockade of separatist territories, making it extremely difficult for the people living there to receive pensions and other social payments. "I very much hope to make these people feel that Ukraine needs them just as much as they need Ukraine," said Zelenskiy, who won nationwide fame for playing the nation's president in a popular TV sitcom. "It would be necessary to take a lot of humanitarian steps." Zelenskiy also said he would push for an early parliamentary election. Ukraine's Supreme Rada is controlled by Poroshenko's ruling party, and the next parliamentary election is due at the end of October. Zelenskiy said an early parliamentary election of is part of his idea of a "renewal" of the country's ruling elite, but conceded it may take months to make that happen. The latest opinion poll released Thursday showed the comedian maintaining a massive lead against Poroshenko. Supporters see Zelenskiy as a man who could tackle the nation's economic woes and corruption, but his opponents point to his lack of political experience. The survey, conducted by the Rating agency, shows Zelenskiy with 58% support while Poroshenko has just 22%. The poll of 3,000 people had a margin of error of 1.8 percentage points. Last edited by UWDude; 04-18-2019 at 10:51 PM. A comedian tipped to take over Ukraine's presidency vowed on Friday to dismantle the old political system as he went head-to-head with his incumbent rival in an extraordinary stadium debate before this weekend's vote.Polls show Volodymyr Zelensky, a 41-year-old standup comic with no political experience, handily defeating President Petro Poroshenko in a second-round of voting on Sunday. The hour-long debate at Kiev's Olympic Stadium capped a weeks-long sensational campaign in a war-torn country seen as a buffer between the European Union and Russia. "I am not a politician," said Zelensky, opening the first and only policy debate of the presidential race. "I am just a simple person who has come to break down this system," he added. "I am the result of your mistakes and promises," he told the 53-year-old president as the spectators clapped and jeered. The television star's bid was initially dismissed as a joke but he leapfrogged establishment candidates amid frustration over corruption, economic trouble and a conflict with Moscow-backed insurgents in the country's east. Police said more than 20,000 spectators were in attendance. At times Poroshenko -- who wore a suit but no tie -- seemed more confident but the consummate showman Zelensky dominated the head-to-head, often putting the Ukrainian leader on the defensive. Dressed in a smart suit, Zelensky delivered a strong performance in which he demonstrated his trademark showmanship and a bit of theatrics, flashing victory signs and peppering his speech with catchy slogans. At one point he went on one knee in honour of those who died in the war with insurgents, prompting Poroshenko to do the same. The rivals opened the debate on a positive note by shaking hands but quickly launched mutual attacks. Behind them stood their wives, teams and backers including fatigue-clad servicemen who supported Poroshenko. The Ukrainian leader attacked the inexperience of the untested Zelensky and said he tried to be many things to many people. "We only have a beautiful, bright sweet wrapper in which everyone can find what he is looking for," said an emotional Poroshenko. He slammed Zelensky for avoiding active-duty military service and added he would not be able to stand up to Russian President Vladimir Putin. "An actor without any experience whatsoever cannot lead a war against an aggressor." Poroshenko also zeroed in on Zelensky's ties to controversial tycoon Igor Kolomoysky whose TV channel broadcasts the comedian's shows. Zelensky said the self-exiled tycoon would go to jail if he violated any laws. Many observers said the comic won the debate. "Poroshenko lost," author and producer Illarion Pavliuk said on Facebook. "Whether you like it or not." Russian foreign ministry spokeswoman Maria Zakharova dismissed the event a "circus". The debate brought to a close a race that has at times descended into farce as the candidates exchanged insults and underwent drug tests. A survey released Thursday showed Zelensky winning 73 percent of the vote against 27 percent for Poroshenko. All times are GMT -6. The time now is 03:39 AM.